A brilliant young Cambridge University engineer is carrying out secret research for the Admiralty. It will lead to the building of the world’s most powerful battleship, The Dreadnaught. His adventuress mother is kidnapped and having been spurned by Scotland Yard he seeks the help of Sherlock Holmes. Was she taken by German spies, or an underhanded student, or by someone else? Whoever it was is prepared to commit cold-blooded murder to get what they want. 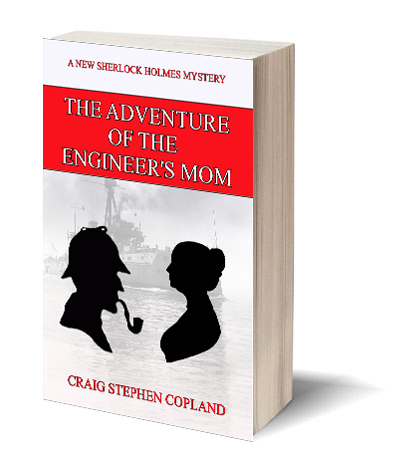 Holmes and Watson have help from an unexpected source – the engineer’s mom herself. This new mystery is inspired by the original Sherlock Holmes story – The Engineer’s Thumb. It is set in the same era in England and you will encounter several of the original characters, but now in a completely new traditional Sherlock Holmes mystery.